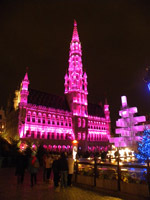 As the capital of Europe, Brussels is definitely worth a visit. With its many old buildings and the truly magnificent Grand Place (or Grote Markt), it has a character of its own. There are many nice restaurants and even in the dark days of winter, there is still a bit of a bustle. It is an expensive place to stay, even compared to other European capitals and it is absolutely freezing in February. The beer does make up for this though. Le Marmiton is charming little restaurant in the centre of Brussels. Food is mainly classic French dishes and every one is cooked expertly by the chef. Favourites include Sole Meunière, Slivers of duck breast with ginger & pink pepper and Speculoos icecream. The staff are very friendly and this is one place I will definitely go back to. 25-40 EUR for a two course meal. A slight oddity was finding a Japanese restaurant in the middle of Brussels, but Ninja House is a cracking find. The menu has no less than 93 dishes, and the all-you-can-eat price of 27 EUR entitles you to 5 rounds of as many dishes as you can finish from the menu, plus dessert. Drinks are extra. We had some great food here, but it is not a restaurant I would go to on my own, as the dishes are really made for sharing. Brussels Grill was one of those places I was initially slightly sceptical of, having its menu outside with big pictures of all the dishes, which normally means "tourist trap". However, the food is really good, the staff normally very friendly, and the beer very drinkable. A steak or grilled chicken is relatively cheap compared to other Brussels restaurants, and this one was very handy on a cold winter's night, being just outside my hotel. Another Brussels Grill restaurany is just off Place Rogier, and is slightly larger than the one at De Brouckère. The menu is the same, but it was nice to have a little walk up the pedestrianised shopping streets before dinner. The Hotel Métropole is an elegant 19th century hotel in the centre of Brussels. It has had an interesting history, including being recquistioned during the Second World War by both the Germans and the Allies. Many original features remain, including an ancient cage elevator, which we nicknamed "The Lift of Death". The rooms vary in shape and size, but all are clean and comfortable. Whilst there are no "cheap" hotels in Brussels, this at least seems to offer reasonable value for money and I stayed here for many weeks. The Radisson BLU Royal Hotel is somewhat more modern than the Metropole and offers everything you could want on a business trip. A little expensive if you are staying more than a few nights, but a nice place to be based.